Sources told Autoweek, an affiliate of Automotive News Europe, that the transmission in the new G class will offer an automatic stop-start function. Mercedes-Benz has slyly revealed a lightly face-lifted version of the 33-year-old G class prior to its planned public premiere at the Beijing auto show next month. The reworked version of the German carmaker's iconic military-grade SUV, planned to go on sale in European markets in June with North American deliveries slated to begin by the end of this year, can be seen in the background of an official photograph of the face-lifted GLK posted on the Mercedes-Benz media Web site. Among the subtle changes made to the G-class's boxy exterior is a restyled grille with three prominent slats in place of the older model's seven slats, new headlamp inserts with horizontally mounted LED running lights and redesigned mirror housings. Not seen in the picture but also evident in recent spy photos of prototypes testing on public roads are altered tail lamp graphics and a new line of alloy wheels. Official information has yet to be released, but insiders confirm that both of the G-class's standard engines are retained for the 2013 model year, including the 383-hp naturally aspirated 5.5-liter V-8 and the 208-hp, 3.0-liter V-6 diesel. Up until now, the diesel powerplant has not been offered in North America. Further up the lineup, the 12-year-old G55 AMG's 500-hp supercharged 5.4-liter V-8 finally makes way for a 536-hp version of Mercedes-Benz performance division AMG's twin-turbocharged 5.5-liter V-8 in a new G63 AMG. 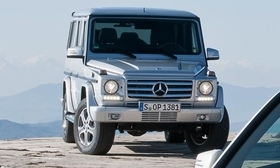 The big news, however, surrounds the addition of a new G65 AMG range-topping model to the lineup. It runs the same twin-turbocharged 6.0-liter V-12 recently confirmed for the SL65 AMG. It is claimed to propel the 2500kg-plus G65 AMG from 0 to 100kph in 5.2 secconds. Top speed is limited to 250kph. The G65 AMG will be the first G-class model to receive V-12 power. In a move that promises to bring substantial fuel savings to all models, the reworked G-class will use Mercedes-Benz's seven-speed 7G-tronic transmission in place of the older five-speed 5G-Tronic unit in use since 1979. Sources told Autoweek, an affiliate of Automotive News Europe, that the new gearbox will offer an automatic stop-start function along with brake-energy recovery, but only on the G63 AMG. Other upgrades brought to the G class, which continues to carry the internal code-name W463 and is produced by Magna Steyr in Graz, Austria, is a revised instrument cluster bought over from the third-generation M class, a 4.5-inch color monitor and Mercedes-Benz's latest COMAND system that incorporates Internet-based functions.